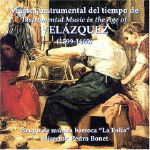 Works performed by Pedro Bonet (Recorder), Fernando Sanchez (Dulcian) and La Folia. 12. Jacob van Eyck : Der Fluyten Lust-hof: no 47, Variations on "Batali"